Personal vegetable gardens provide a steady source of fresh vegetables with low environmental impact. Having a small indoor greenhouse is a way for urban apartment dwellers without access to gardening space to have their own personal vegetable garden. 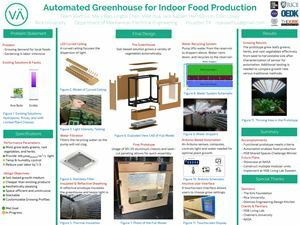 We aim to create an automated, modular, and indoor greenhouse to facilitate high-throughput food growth aimed at serving young professionals who live in urban settings. Our goal is to automate watering, lighting, temperature, and humidity through using sensors to determine the state of the environment, then implementing closed-loop control based on determined thresholds for environmental variables. HSB Shared Space Challenge 1st Prize - $12,000 Prize & Airfare to Sweden to develop and install prototype.